​For the complete 2018-2019 calendar, please visit the ASFS Master Calendar. Hard to believe that we are nearly halfway through the 2018-19 school year, and it's already time for our next round of parent coffees. Held twice a year in the Library from 9:00-10:00am with Ms. Begley and/or Ms. Jones and at least one grade level teacher, these informal events are a great chance to learn what's happening in your child(ren)'s classes and get your questions answered. Hope you can join us! Purchase your 2019 ASFS Auction Tickets (early bird tickets available through 1/31), and see below for more details on the auction coming up on Saturday, February 23rd from 7-11pm at Clarendon Ballroom! Donate items to our first ever ONE T.E.A.M. Hands to Hearts ASFS Community Service Week (details below) - donation drives kick off next week! Next week is Virginia School Principals Appreciation Week (January 20th-26th). Show your gratitude to our school leaders, Principal Mary Begley and Assistant Principal Barbara Jones, by having your child(ren) bring in a card, handwritten note, drawing or token of appreciation to say thank you for all they do to support our school and students. Arlington Science Focus School would not be the amazing school that it is today without their leadership and dedication to ASFS. THANK YOU, Ms. Begley and Ms. Jones!!! The 2019 ASFS Auction is coming up soon (February 23rd from 7-11pm at Clarendon Ballroom)! EARLY BIRD tickets are available now here! Family Donations: We are looking for desirable, unique, and high-quality donations of all sizes and are asking everyone to think through their entire network of family, friends and colleagues - anyone you know that might have access to popular and/or creative auction items. Do you know someone with a vacation home who is willing to donate a week or weekend? Sports tickets? Unique experiences like a behind-the-scenes tour? If you have a business in mind, please check with our Business Donations Lead, Patricia Wilson (patotis1@gmail.com) so we can confirm there are no redundancies. Please contact our Family Donations Lead, Rebecca Lee (rfarlee@gmail.com) to learn more. Please join Debbie Bulford, ASFS Resource Teacher for the Gifted, on Wednesday, January 23rd from 8:00-9:00am in the ASFS Library for an overview of the Gifted and Talented Referral and Screening Process. Light refreshments will be served. Hope to see you there! 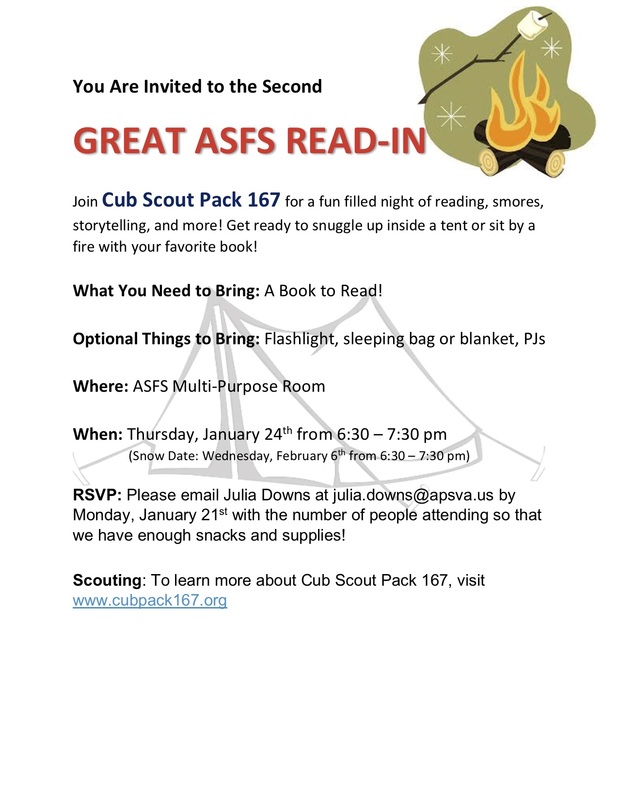 We are thrilled to announce our first ASFS Community Service Week - February 4th-8th, 2019. Leading up to this we have a series of drives to help fulfill needs of the amazing charities below. All collection drives are Tuesday, January 22nd - Friday, February 1st. Kindly consider donating based upon your child's grade/charity needs. Feel free to cross donate if you have items from list below. A-SPAN offers food, shelter and support services to 50 homeless people daily with the goal to end homelessness in Arlington. On Monday, February 4th Kindergarten & 1st grades will make over 100 bagged lunches with artwork and/or notes for the receiver. How You Can Help: Sign up to provide hands-on help with the lunch project from 9:05-9:50am or to donate supplies for the bagged lunches. Operation Turbo ships "Boxes of Home" to deployed military stationed around the world. On Tuesday, February 5th 2nd & 3rd graders will collate the goodies and create notes for the receivers. Also included will be return notecards addressed to the school so the students may hear back from the military women and men. Lost Dog and Cat Rescue Foundation helps homeless pets find their way into loving homes through rescue and adoption. On Thursday, February 7th our 4th graders will create cozy no-sew fleece blankets for the animals. Cherrydale Health & Rehabilitation Center provides long-term care to seniors and short-term rehabilitation care. On Friday, February 8th, students will work in groups to make no-sew fleece blankets. After-school, interested 5th graders may sign up for an optional after-school outing to make Valentine's Day cards with the residents (forms due by Friday, 2/1). Look for details in the flyer/field trip form sent home with students and via email. Please direct any questions about Community Service Week and the donation drives to Karrie Beaudry. The Arlington Food Assistance Center stands ready to assist Furloughed Federal Employees. AFAC is available to provide free weekly groceries to all Arlington residents in need, including those affected by the federal shutdown. AFAC has no income limits - ever - and is available to families and individuals who need short-term or long-term food assistance. Please visit afac.org/govshutdown for more information regarding services for furloughed federal employees. Any Arlington resident may be served one-time without a referral by simply presenting a photo ID & proof of address (state ID, lease, or water/electric/gas bill) at one of our food distribution centers. To receive groceries on a weekly basis, clients must obtain a referral from a social worker, typically through the Department of Human Services or the Arlington Public Schools. Ms. Washington, our ASFS Social Worker, can help with any referrals. Please don’t hesitate to ask. Attention all coaches that use ASFS: If you are providing food for students, you may ONLY eat in the multipurpose room. Do not use any other rooms such as the Staff Lounge. Contact Ms. Begley if you have questions. Parents, there is a total lunar eclipse happening this Sunday, Jan. 20th, so you might want to make an exception and let your kids stay up late this one night—the next one won’t happen (at least visible in N. America) for another few years! The partial phase begins 9:37pm, with totality from 10:41 to 11:43pm, and then partial again until 12:50 am. It’s called a "super blood wolf moon", with "super" because it’s super big, being near perigee (when the moon is closest to earth in its orbit); "blood" because the moon looks red during a total eclipse; and "wolf" because it’s in January. You don’t need a telescope to observe—you can just watch with your naked eye (it’s not dangerous to look at, unlike a solar eclipse). If you have a good pair of binoculars, it will give a great view. In December 2018, the School Board approved Dorothy Hamm Middle School as the name of the new middle school at the historic Stratford site. As part of the process to start a new PTA, an informational meeting will be held on Tuesday, January 22nd at 7:00pm in the Library at HB Woodlawn. 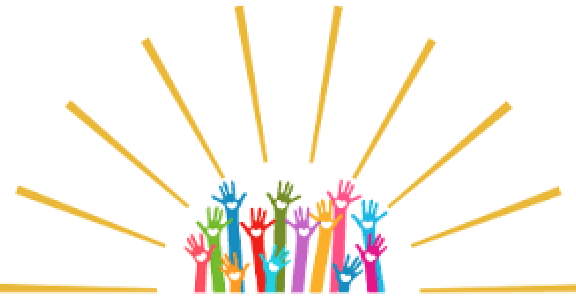 Save the date for a second organizational PTA meeting on Tuesday, February 19th at 7:00pm in the Cafeteria at HB Woodlawn. All interested parents are invited to attend one or both of these meetings. 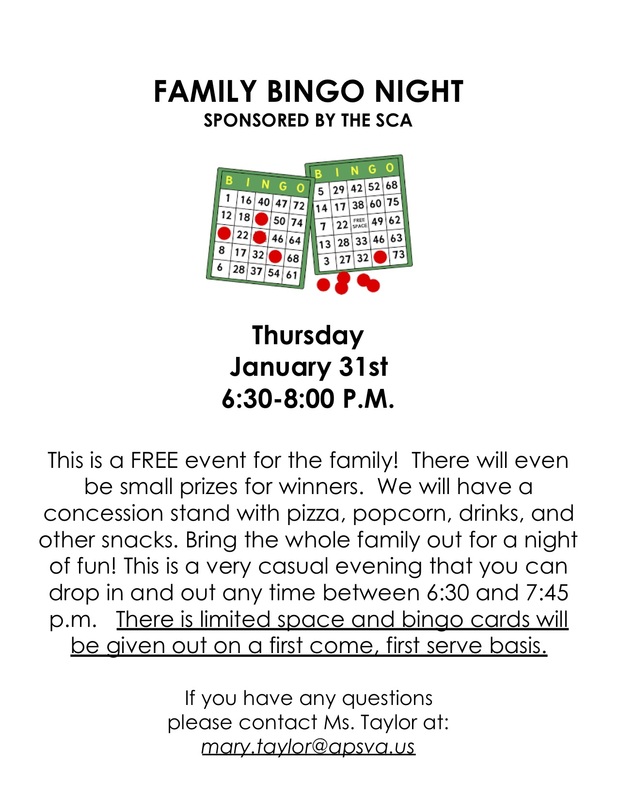 Are you looking for child care on Monday, January 28th? With no school for students, if you need child care or would like a fun option for your child(ren) to spend time with ASFS friends during the upcoming Grade Preparation Day, Baroody Camps is offering a one-day camp to be hosted at Arlington Science Focus School on Monday, January 28th. Kids will spend the day engaged in a variety of programs that will foster children’s development and curiosity in a challenging and structured environment. All classes are held on-site in a familiar setting, at a convenient location, and with lots of fun planned! Core camp hours are 9:00am-3:00pm with before and after care available. Visit the Baroody Enrichment Website to register today! Contact Baroody Camps with any questions. Some new and exciting news about Yearbooks! This year we are trying a new system for ordering Yearbooks. There are two ways to order and five different Yearbook packages to choose from. Complete the paper order form (looks similar the Picture Day order form) that your child will bring home. NOTE: Autograph Inserts are being provided with each yearbook ordered. Please contact Ms. Caven with any questions or concerns. Thank you for supporting our school! In recognition of the 50th Anniversary of Apollo 11 landing on the moon, students from K-12th grade in the DMV area are invited to participate in the 2019 Sports, Math and Scientific Hypothesis Contest! To enter, please draw on an 8.5” x 11” paper a connection between the world of sports and the world of math and science. Multiple prizes will be awarded in each division and lucky winners, their families, and teachers will get to meet inspirational heroes including an Astronaut, Washington Redskins alum, and others at a VIP reception! Entries must be postmarked by March 4th. Please click here for more details on how to enter. 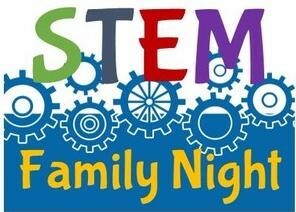 Please join us for our annual Family STEM Night on Wednesday, February 13th from 6:30-8:00 p.m.! Some of the highlights of the event include: engineering challenges, a computer programming room (“Coding Zone"), a simulated mission with the space shuttle simulator, demonstrations from our two First Lego League teams, and more! Parents, your help is greatly needed to help make our Family STEM Night a success! We are looking for as many volunteers as possible. If you can help with either set-up, greeting, manning the different STEM challenges/stations, and/or clean-up, please click here to sign-up or or you can e-mail Ms. Lin. We split up the night into two shifts (6:15-7:15 p.m. and 7:15-8:15 p.m.) so that you have some time to enjoy the STEM night with your child. Thanks so much! ​​All eFF submissions must be received by Eveline Broderick by noon on Wednesday. All content will be subject to approval by ASFS administration and the PTA. © 2019 ASFS PTA. All rights reserved.